Fall is a season that is packed full of fun activities, crisp weather, beautiful colors, and delicious food. Outside the leaves start to turn golden-red and the ground gets scattered with those gorgeous leaves, branches, and acorns. Your daytime walk can become a hunt for the biggest acorn of all. Then, after dinner, you can head outside again and see how big of a pile of leaves you can make- and jump in! If it's too cold to spend time outside, the fifteen fall crafts for kids below will help you bring the gorgeous colors outside your window, inside. Adorable Leaf Hedgehogs are the perfect mantle addition to fall decor and the Leaf Garland is perfect for your staircase. 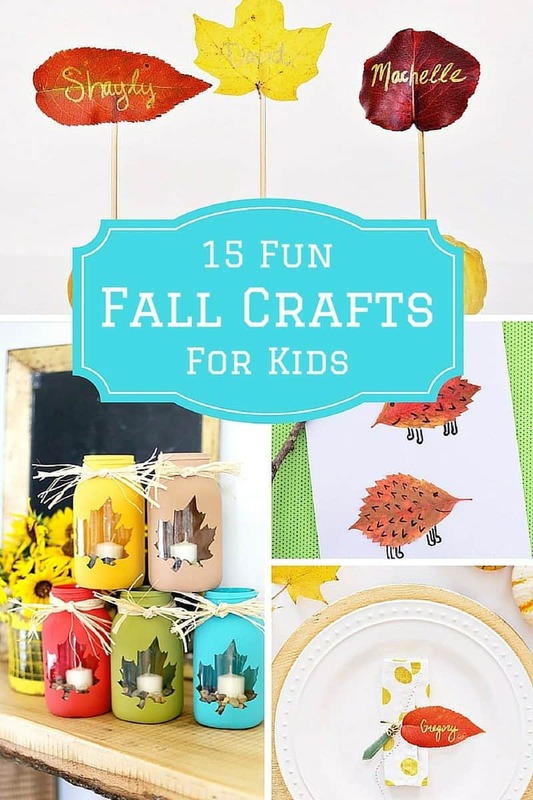 Without further ado, here is the list of fun fall crafts for kids. Click on the title of each craft to view step-by-step instructions and images. Happy crafting! Have you ever done one of these fall kids crafts? If so, we would love to hear about it in the comment section below. Also, if you would like even more terrific Fall craft ideas take a look at these 14 Festive Kids Autumn Crafts. « Nutrisystem Week 12 Update: Did We Meet Our Goals?! Such cute ideas! Thank you! I love the Fall Mason Jar Candles and the Pumpkin Handmade Card. These are really cute ideas. Omgosh I adore the little leaf animals!! Too cute! !